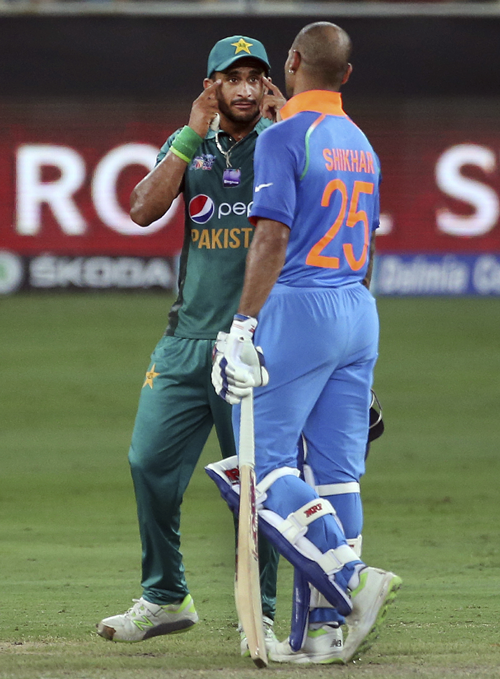 Absence they say, makes the heart grow fonder” -- this is precisely how one can term the India versus Pakistan cricket encounters in the ongoing Asia Cup. A year has elapsed since the two teams last played against each other, that too in the final of the Champions Trophy in which Pakistan got the better of India. Millions of Indian fans were anxiously waiting for revenge and they got it when India, with an immaculate performance, routed Pakistan in the group stage of the tournament in Dubai. It reminded one of a similar victory that India scripted in the league stage of the Champions Trophy as well. On Sunday, September 23, another nail-biting encounter between the two sides, this time in the Super 4 stage, will take the centre stage. With Sri Lanka already out of the title race, a final between the two nations seems quite imminent. If that happens, it will lead to an astounding viewership and a bonanza for the game of cricket. The on field rivalry between the two teams, the charged up atmosphere and the media as well as the fan following is so intense that a defeat for any of the nations is never an option. Cricket is perhaps the only sport that brings out such strong feeling of patriotism and national pride. This definitely is a much healthier way of settling a score. Unfortunately, the political tension between the two countries has escalated to such an extent that a sport that has all the ingredients of diffusing hatred cannot be played on each other’s turfs. One quite understands the situation, but if peace and sanity need to be enforced, cricket is an ideal tool that can do so. I have had the privilege of not only playing against a Pakistan cricket side but also of having them as my teammates. The respect and friendship that one had for each other was so warm and wonderful that playing against one another was always a healthy competition. Of course, there were banters and snide remarks popularly termed as “sledging,” but those were taken without any malice and seriousness. After 1962, cricketing ties between Pakistan and India commenced only in 1978. However, during the mid 70’s, many Pakistani players visited India to play benefit matches for former Indian cricketers. The present pri­me minister of Pakistan Imr­an Khan, Zaheer Abbas, the famous Mohammed brothers, Intikhab Alam and so ma­ny others travelled with us by trains, buses and stayed in guest houses with families without a care and concern for their security and protection. The tales they shared about their experiences while playing against cricketers from other Test playing countries gave us a better insight for our overseas tours. The close-knit friendships continued when we met while playing professional cricket in England, helping each other at every possible juncture. I will always be grateful to Sarfraz Nawaz, who came to bowl to me in the nets in the morning of the Test match at The Oval in 1979. There was only one thought -- to prepare me against the moving ball when I played later on that day against England. Another wonderful incident comes to the mind, which happened during a benefit match played in Ahmedabad for Dilip Sardesai. Imran Khan and I were on the same side. He strategised a plan to get the great Sunil Gavaskar caught at short-leg by me off a short delivery. He signalled to me every time he decided to bowl short and my role was to be ready to lunge forward if the ball popped-up from Gavaskar’s bat. But the little master showcased just how flawless his defensive skills were, and finally after an hour, Imran accepted defeat. His words, in Hindi, were: “This is a rock that cannot be moved.” Imran still rates Gavaskar as the best and this must have been precisely why he extended an invitation to him to be present at his swearing-in ceremony as the prime minister. During the 1979 World Cup, the English organisers, quite uncaringly, sent us to the cold city of Scarborough to play warm-up games against Pakistan. While we barely got much cricket, we rejoiced in the opposition’s company and had a wonderful time getting to know each other. The recent gesture made by Virat Kohli in presenting a signed bat to Shahid Afridi is just one such story of the goodwill between the players. The unfortunate part of a game of cricket between the two countries is the media and the national hype, which turn it into a battle between rivals rather than friends. It, therefore, becomes a stage where every cricketer from Pakistan and India wants to perform, as it has the adrenalin that every sportsman thrives for. Cricket stars are born as well as demolished solely by their performance. The game of chance, therefore, makes it even more thrilling. However, the action thrives through versatile “cricketers,” who play with intensity but respect each other immensely. All cricket rivalry is forgotten by the players once the game is done and dusted. The only positive way to start a peaceful movement involving India and Pakistan, something that’s being so astutely pursued by both the prime ministers, is through cricket. With Imran Khan at the helm in Pakistan, one hopes that the shackles that bind us are broken forever. India has looked a better side than Pakistan so far in the ongoing Asia Cup. However, the ultimate goal for both the sides will be the ODI World Cup scheduled next year. Therefore, a win or a loss here is not of much importance. The ultimate test will be when they meet each other at the Old Trafford, Manchester, on June 16, 2019. Till then, let the better side win.